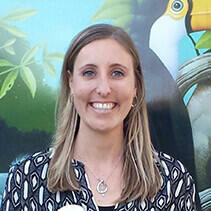 Dr. Mackenzie Borau serves San Diego Zoo Global as a Conservation Program Manager in Community Engagement. She is the Graduate Program Advisor for the Advanced Inquiry Program, an innovative graduate program offered jointly through San Diego Zoo Global and Miami University of Ohio’s Project Dragonfly. The Advanced Inquiry Program (AIP) promotes real-world experience through inquiry-based and participatory learning to address current and future conservation issues. Students enrolled in AIP are passionate about becoming engaged environmental stewards and leaders in driving social and ecological change. Mackenzie advises educators and professionals pursuing either a Master of Arts in Teaching (MAT) in Biological Sciences or a Master of Arts (MA) in Biology, and facilitates students’ project development, collaboration, community engagement, and the integration of course material with the long-term goals of individual students, the Institute, and Project Dragonfly. Mackenzie earned her bachelor’s degree in Biology from Trinity University, Texas, and her master’s and doctorate degrees in Biological Anthropology from University of Calgary, where she researched the social behavior, nutrition, and energetics of white-faced capuchin monkeys. She gained teaching experience as an assistant and instructor for a variety of courses at the University of Calgary, and as a mentor for young women in Alberta. Mackenzie is passionate about education, wildlife, and mentorship, incorporating all three into her work at San Diego Zoo Global.